How can I get dye to penetrate through thin veneer? Hello, Im not sure If im posting this in the right place but Ill go for it. Basically I make things with all types of wood veneer. My main problem is that I want to dye my maple veneer different colors. I bought some keda dye, its some sort of analine dye. I cannot get the dye to penetrate past the top layer no matter what I do. It looks great until its time to sand and the real wood actually starts showing up. Should I use a certain technique, or another dye? Its almost paper thin, you would think it would have no problem penetrating. please describe your veneer application procedures. (step-by-step) and coloring process. are you trying to color the veneer before you glue it to something ? or – color it after it is all glued down and ready to sand. the adhesive seeps up to unevenly block the penetration of stain. and the color goes into the cells deeper. but of course – you must have the equipment to do this at home. small pieces of veneer to see if you can achieve a deeper penetration of color. if that works – then you can experiment further with that process. try 20-30 minutes for the first try with the home shop vac. Thin veneer is easy. I use fabric dyes (Tulip, Rit, etc), hot and soak for about three days for 1/16” veneer. Thin commercial veneer which is mostly 1/42” will fully penetrate in a day, maybe even less. I don’t know for sure as I don’t use much of it. I have recently dyed some 1/32” and it fully penetrated in about 30 hours. The difficult part is finding a container to dye in. It has to be able to resist the acidic dye and it is best to have the veneer vertical. This is my current arrangement. The vessel shown is a “hotel pan” like you see in steam tables at buffets. This one is called a quarter size and is 8” deep. 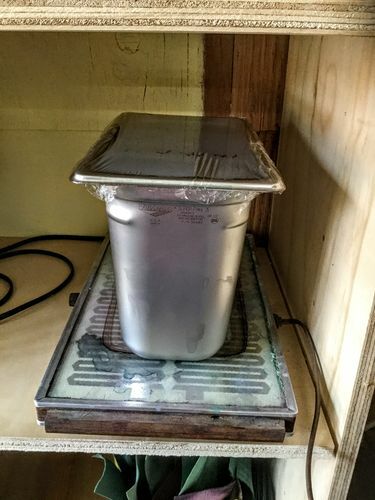 It is sitting on a warming tray that keeps it ~175 degrees F.
Thanks so much! I wonder if I boiled some fabric dye, and poured it in a thermos with veneer if it would work until I can get a setup similar to yours. Either way the veneer is getting squished in a mold so I dont need to retain the organic shape. I have noticed that If I boil the veneer it penetrates much deeper but evaporates too quickly so something like you have is perfect. I think it’s common for dyes and stains to be pretty superficial. They don’t penetrate the wood very deeply, especially hardwoods. By the way, why are you sanding dyed veneer? Would you have better luck using wood that has a rich natural color like walnut or padauk? It will lose shape and expand a lot in the hot dye. It needs to be completely dried before use. The best way is to let it “drip dry” first and when it is just damp, press it between layers of newsprint type paper, changing paper occasionally until it is dry. I buy packing paper from Staples for that (and a multitude of other veneer related tasks). Just some context for you all. This is what I am making, the colored ply veneer boards are much more popular than what I like which is just natural wood. As you can see it is purple but the edges where I had to sand really show up bad. I need it to be vibrant all the way around. Have you tried dye after assembly? I thought you did inlay or something similar where this could be a problem. But as noted above I am not certain why would you want to dye the veneer separately in your case. They have to be separate because the board consist of 5 plys of veneer. It is extremely popular to have vibrant ply combinations that can bee seen from the side. This is the reason why they have to be dyed one by one. 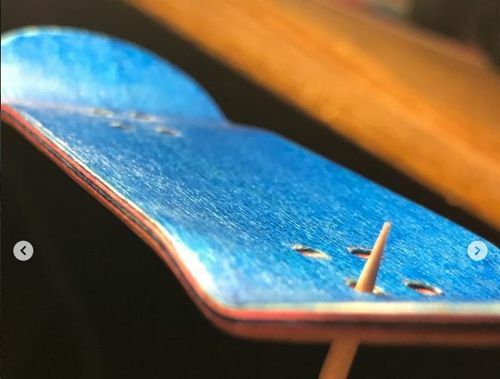 Notice the ply combo in the middle of red, and blue. It looks like straight trash, because after sanding veneer that has not been penetrated it starts to show through. what is that? a miniature skateboard ? 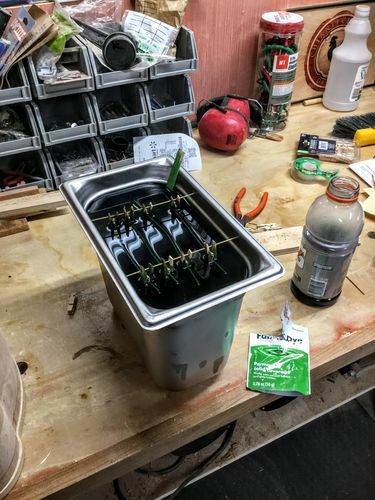 Also when we dyed maple veneer – we soaked the veneer in 200 degree distilled water, for half a day, and poured off the – - pretty nasty water – with the tannins in it. Helped to get a truer color, when you get rid of the “extra” brown coloring. Would an old crock pot work to keep the dye warm? Realizing this thread is over 9 months old, and now idle, plus admitting I now nothing about coloring veneer. 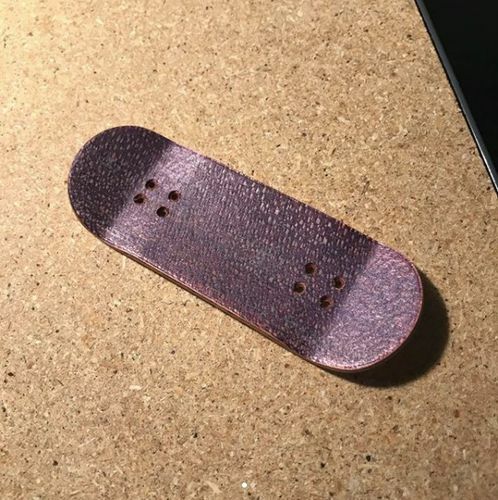 According to my skate boarding son, there are several sources for dyed veneers for DIY Skateboards? He pointed me to websites for RoarRockit and B&B Rare Woods? They both appear to sell dyed veneers requested? As wood worker, suggest you might be able to get dyed laminated plywood panels from a commercial dyed plywood mfg? Try calling Cousineau Wood Products. They will create custom sized panels, as well as custom colors. A slow cooker, even on low would likely be too high of a temp. You can get a pork shoulder up to ~200F on low if you leave it on while you work. However, some of them have a temperature function, which should work, as you can figure a way to keep the veneers vertical with the lid on.